Slovak Paradise National Park is one of Slovakia’s 9 parks and one of our favorite ones. It’s the place to chase waterfalls in adventurous glens and ravines. It’s the scene of our first spring hikes and our last autumn hikes in Slovakia. Is it a hidden gem? It’s a pretty gem, for sure. And it’s very popular among the people who know about it – the Slovaks and other passionate hikers from the neighboring countries (yes, that’s supposed to mean us, too). But it looks like most of the people in the world don’t know much about the Slovak Paradise. In this series, we’d like to take you to our favorite trails in this charming little paradise. Our first stop is the Hornád River Canyon (Prielom Hornádu). Hornád River is the largest stream in the Slovak Paradise and there’s a long trail all along the lovely and adventurous canyon it carved. Lovely because… well, just take a look. And adventurous because at some places we climbed the iron steps built in the sheer rock wall to get above the river and continue our way. As the canyon gets wider and narrower again and again, there are a couple of these challenging iron routes and we enjoyed them very much. 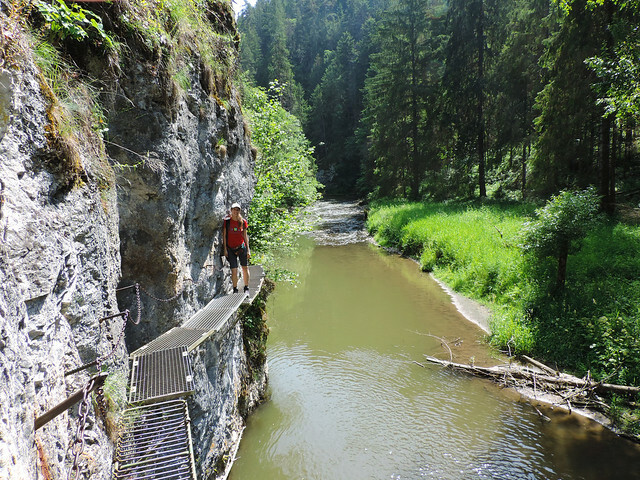 They are iconic to this trail and it’s a wonderful experience to look down at Hornád River roaming below your feet (assuming you are not fearful of heights, we might add). 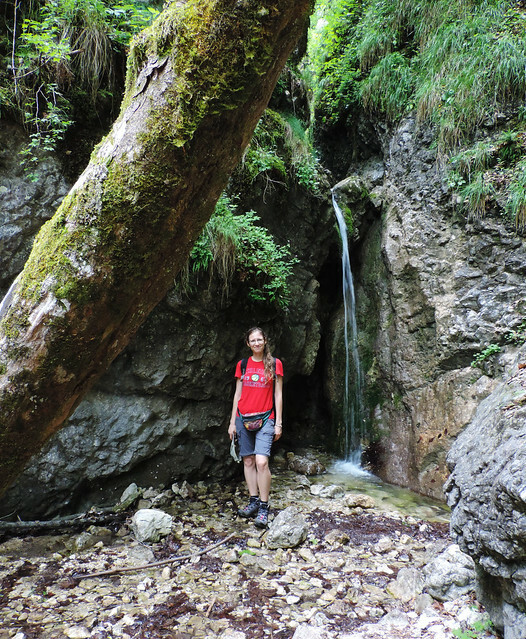 You can choose to start your hike at either end of the canyon: Podlesok or Čingov. The hike takes about 4 hours one-way, then you need to follow the same route to get back. But there are other options we’d recommend! 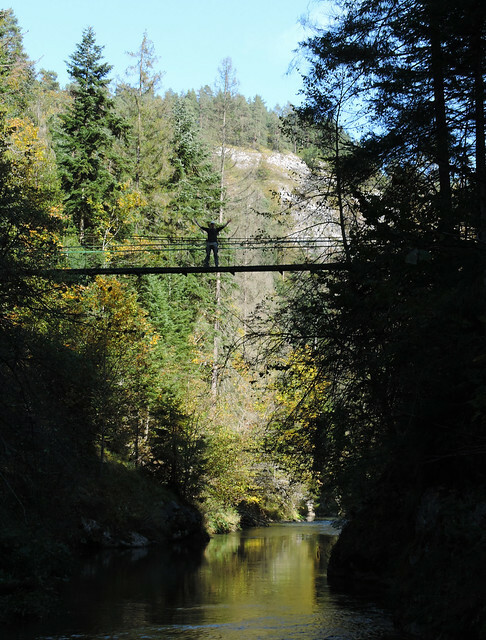 In addition to being as lovely as it is, Hornád River Canyon is also an entrance to other glens of the Slovak Paradise. 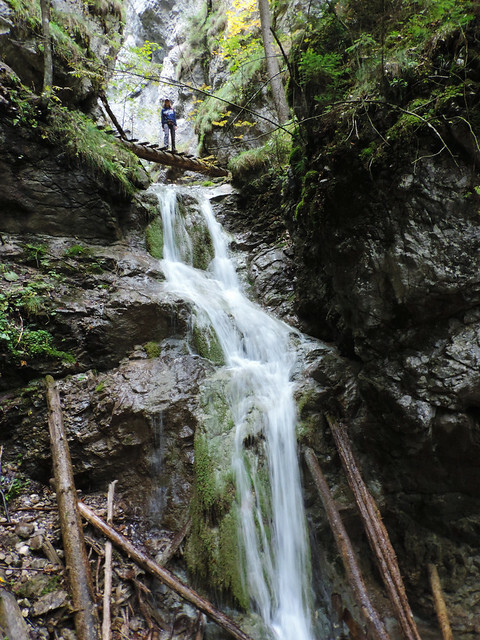 Kláštorská glen is a short one with two smaller waterfalls and some ladders so that you can climb up right by the waterfalls. It ends at a large meadow with a mountain hut in the center – called Kláštorisko. You can have some rest here and decide which way to continue. Because there are 3 different (kind of parallel) glens to choose from. Whichever you choose, you can find your way back to Podlesok in the end. 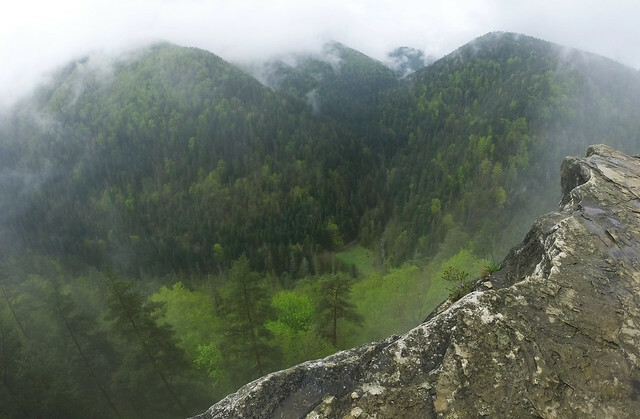 Falcon Valley (Sokolia dolina) is probably the most wild and remote ravine in the park. And it has the highest ladder to climb along 75 meters high Závojový Waterfall! Series of other ladders, footbridges and built-in iron footsteps helped us conquer this ravine and we passed 3 other waterfalls on our way, too. Choosing this path proved to be the longest and most strenuous option. But being so beautiful all the way we had no problem with the length! And climbing the ladders was also fun. The hike in Falcon Valley is about 2 hours one-way, but getting there from Kláštorisko and then returning to Podlesok easily adds another 3-4 hours. Check out this map and our detailed description for more info! Another time we chose to follow the route through Malý Kyseľ. Though it’s somewhat shorter than Falcon Valley, we couldn’t complaint about the lack of challenges. Nor the lack of waterfalls. Series of iron and wooden ladders helped us to explore this corner of the Paradise. The conclusion: we can’t get bored of these charming canyons. 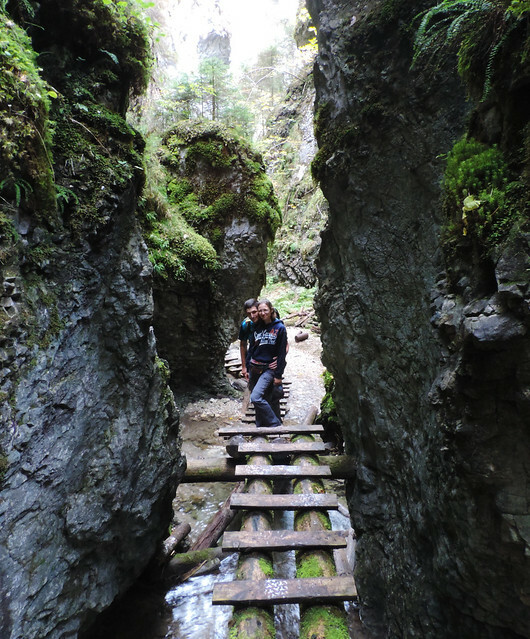 One more reason to return to our Paradise this spring, too: we haven’t been to the third canyon yet: Veľký Kyseľ. That’s the third option to make the loop complete. Starting from Čingov, it doesn’t take long to get to Hornád Canyon either. But first we followed the yellow route to Tomášovský viewpoint (Tomášovský výhľad, 532 m). Slovak Paradise offers a bunch of glens and waterfalls but it rarely offer panoramas since you are at the bottom of the glens most of the time. Tomášovský viewpoint is the great exception, it rewarded us with a fabulous panorama over the Paradise (once that fabulous panorama finally appeared from the fog 😛 ). Then we continued on the green route to get down to Hornád River and on the blue route in Hornád River Canyon. We climbed up in Kláštorská glen that we reached from the other direction this time. That’s the only glen to conquer on this route. From Kláštorisko we followed the blue route in the forest to get back to Čingov. This loop is shorter than any of the Western loops but it’s still a full day hike. Hornád River Canyon is a unique place and it gives access to several of those charming glens that makes this Paradise a real paradise. But there’s another trail starting from Podlesok that’s just as well worth exploring: our next post will be about Dry White Gorge. 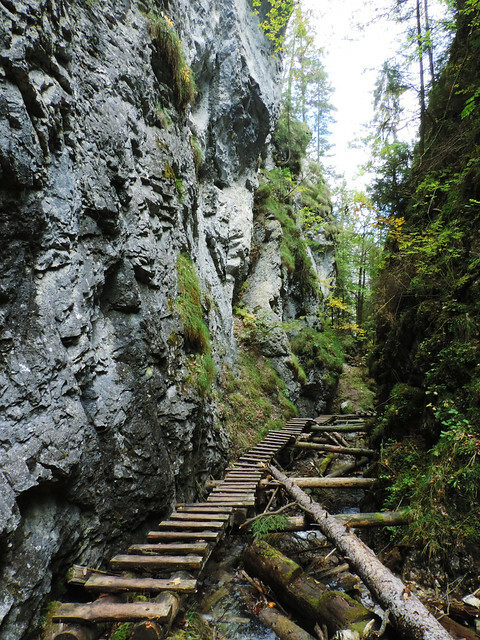 Have you ever hiked in Slovakia? Would you? That canyon is magnificent..Thanks for the hiking advice. Thanks so much for all this detailed information! My husband and I are staying in Smižany and were wondering how we could visit the Slovenský Raj park from here without a car. It looks like there are actually lots of hiking trails that are accessible from here! Looking forward to a big day of hiking tomorrow. Happy to help. 🙂 Have fun tomorrow, it’s a lovely park!